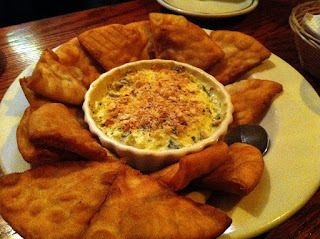 We started with a pretty good spinach dip with tasty pita chips. I thought they short changed us on dip but that's because it was so tasty. The burger menu at Country House is simple yet sophisticated. You can go simple and plain, or opt for buffalo, ostrich (my choice), veggie or turkey. I love the idea of ordering a non beef meat for a burger for the health benefits (or less bad). 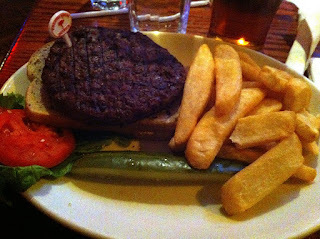 But the ostrich burger was pretty bland a little over cooked. I ordered without cheese but good meat and seasoning should still prevail. Oh well. It's still a fun place and has "Chicago's Favorite Burger" so I bet it was an off night. Looking forward to the next trip for a beer and burger next to the fireplace.